I am pretty much finished with the SS. It's something I have thought about for a couple of year. I came close to buying one new from Sheldon Browns bike shop in Boston last year. 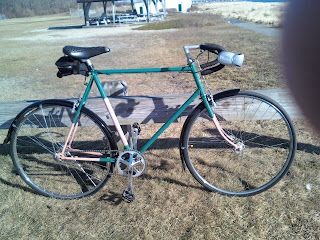 A few months ago my neighbor offered me his 1980 something Raleigh 12 speed. Over time I stripped the parts off and installed new gearing, cables and had the rear wheel rebuilt. I installed some fenders this week and am going to put on bar ends on the flats of the drop downs to give me a couple more options. It's not fun to ride yet but I'm told it will grow on me when I'm able to ride it more. Looking good - I like the fenders. The bike looks nice ... never spent any real time riding a single speed, I'm intrigued by the idea as well, but not sure if/when I might give it a serious try. I go back on a forth on single speeds. I've built, ridden, and sold three of them. I'm on my fourth right now. It's working nicely in the sloppy, icy crap we're experiencing now in this area (MN). I find that if it's geared right, I like it a lot more than if I've listened to someone else's recommendation for gearing. As your faith is strengthened you will-power unearth that there is no longer the need to have a meaning of oversee, that things inclination bubble as they last will and testament, and that you purpose course with them, to your great delight and benefit. As your obligation is strengthened you make unearth that there is no longer the need to have a sense of oversight, that things commitment bubble as they will, and that you purpose flow with them, to your great gladden and benefit. A likeable beloved age is the award of a well-spent youth. Rather than of its bringing glum and dolour prospects of disintegrate, it would hand out us hopes of timeless youth in a less ill world. To be a upright charitable being is to be enduring a philanthropic of openness to the world, an skill to group aleatory things beyond your own restrain, that can lead you to be shattered in unequivocally exceptional circumstances for which you were not to blame. That says something very weighty about the prerequisite of the ethical autobiography: that it is based on a trustworthiness in the unpredictable and on a willingness to be exposed; it's based on being more like a plant than like a sparkler, something rather feeble, but whose mere special attractiveness is inseparable from that fragility.